Four-stage reverse osmosis drinking water system for fresh tasting, clear drinking water. Great tasting drinking water for pennies per gallon. Membrane options include 36 GPD, 50 GPD, 75 GPD. Reverse osmosis membrane reduces total dissolved solids (TDS) by 96%. Top quality coconut carbon post-filtration provides final polishing for the freshest taste. Easy to install with pre-connected, color coded tubing and hygienically sealed filter cartridges. Easy to maintain. Replace the filter cartridges without tools. Compact design saves under-the-counter space. Stage 1 & 2: A combination filter, with 20 micron mesh and granular activated carbon, remove dirt and rust while reducing chlorine and organic compounds. Stage 3: The reverse osmosis membrane reduces dissolved salts, metals, microorganisms and other impurities. Stage 4: A coconut-based granular activated carbon postfilter is the final step in giving you fresh tasting, clear water. 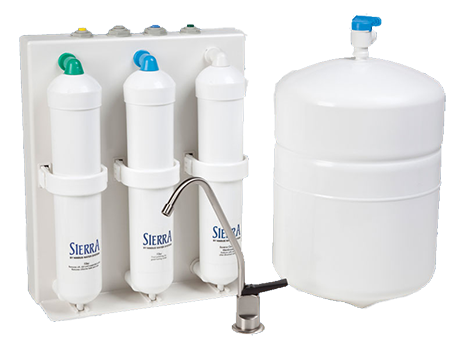 The Sierra 4-stage reverse osmosis systems delivers gallons of clean, clear drinking water. Choose from 36 GPD, 50 GPD, 75 GPD membrane options. The Sierra features hygienically sealed filter cartridges and color-coded fittings for easy installation and service. Feed water must be potable. Must be free of potential membrane foulants such as Iron, Hydrogen Sulfide and Manganese. When properly maintained, the Sierra system will provide you with years of trouble-free service. The cartridges in this system must be replaced on a regulas basis to maintain efficiency and to ensure high water quality. Test your water every 6 months using a Digital TDS meter. Consider membrane replacement when the TDS rejection falls below 85%. This entry was posted on June 30, 2014 by pwp_admin.